I placed an order during Lasting Scent Candles last pre-order back in October. They arrived a couple weeks ago. Since then Pam has announced that was the last pre-order she will be having. Lasting Scent Candles closed a couple years ago due to some health concerns and then Pam opened back up. I am not sure if that will be an option for her again this time. I am thankful I placed an order as I did not know it may be my last. Pam may still open up for RTS with her leftover stock. That is why I will be continuing to review my last purchase. 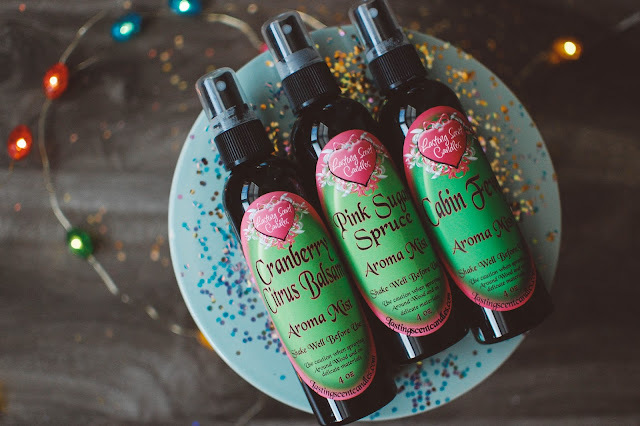 These Aroma Mists turned into one of my favorite items to have on hand in my office, in my car and in my bathroom. They were handy on vacation too for sprucing up musty cabins. 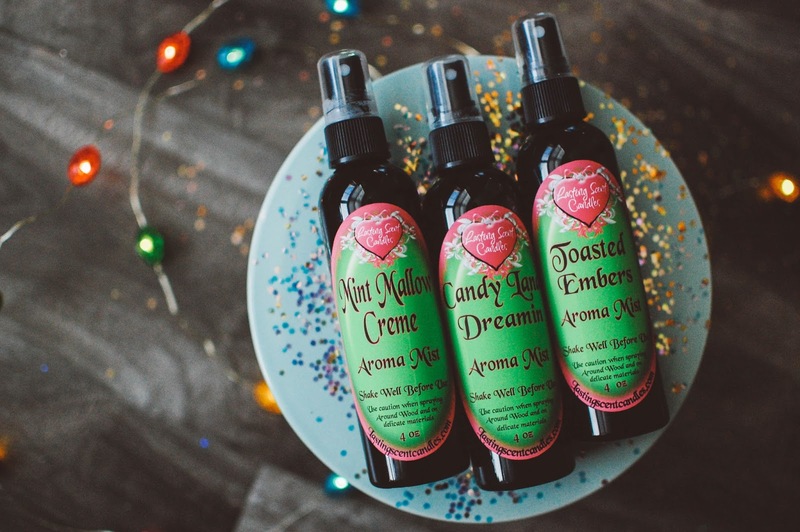 Aroma Mists run $6.75 each. 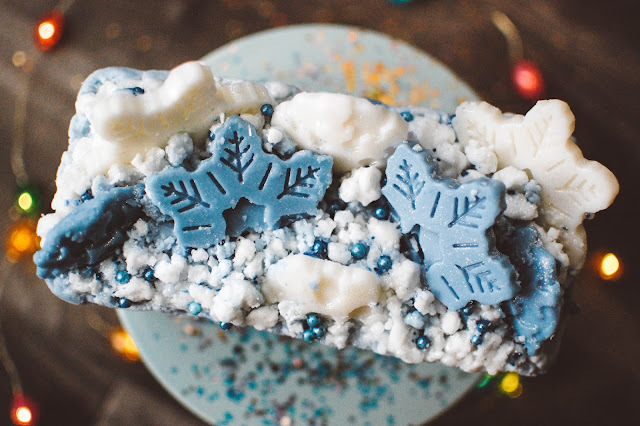 Mint Mallow Creme- This one is mint, vanilla sugar and marshmallow fluff. This strong sweet mint does have a spearmint lean. 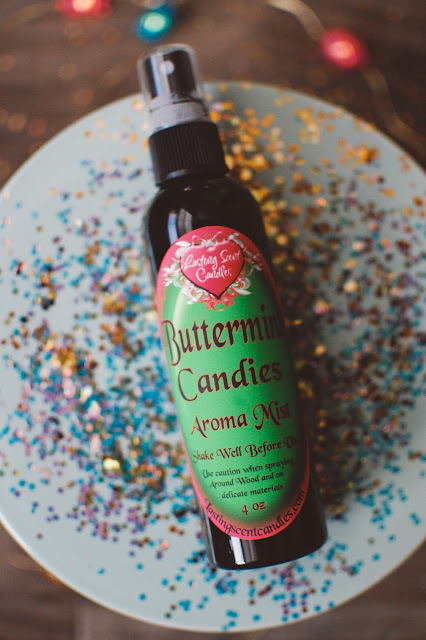 It is similar to the Buttermint Candies scent I have below but Buttermint Candies is more creamy and buttery. Mint Mallow Creme leans more spearmint and crisp. Candy Land Dreamin'- I love this one to the moon and back. Especially in a room and linen spray. I picked up two. Candy Land Dreamin' blends beautifully sweet herbal lavender, peppermint and subtle vanilla sugar. The lavender blooms the most in this format with that cool peppermint tingle to lift it. Toasted Embers- Lasting Scent Candle's Toasted Embers remains one of my favorite Marshmallow Fireside dupes. I love having it in an Aroma Mist. Smoky embers, smooth woods and sweet airy marshmallows slowly toasting over the flames. Cranberry Citrus Balsam- Christmas in a bottle. Good grief. I forget how much I love this scent. Cheerful crimson cranberries and jolly citrus fruits merge with evergreens and fresh cut wreaths. Pink Sugared Spruce- I adore this fragrance but sadly it has not been throwing well for me in the wax format. It is bloody brilliant in the Aroma Mist. Pink sugar crystals, pillowy cotton candy and caramel drizzles decorating festive spruce trees. Cabin Fever- I currently have this one in my Jeep. It is a gorgeous spiced woods fragrance that warms me in the cool weather and smells amazing in a car. One spritz is enough to scent the whole vehicle. This bottle is a back up for the one I have in there now. I also used this particular scent when we stayed in Tennessee last summer to freshen up the cabin. Apt, eh? Buttermint Candies- Just like the pastel after dinner treats that melt on the tongue. 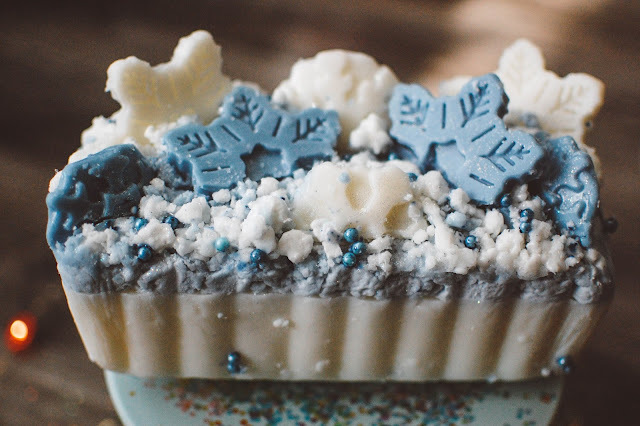 Extra buttery and vanilla laden with a hint of cooling peppermint. I forget what type of contest there was going on in the Facebook group, but it turned out that I won and the prize was a loaf in Winter White Cake. This is a great scent. More for the vanilla mint lovers who like their vanilla heavier than the mint. It is a stunningly gorgeous loaf of wax and the nice thing about Lasting Scent Candle's soft wax is that it cut like buttah. I will be posting the wax tarts I picked up tomorrow. I must say 2018 has seemed to be a year of change for many of my favorite artisan creators. 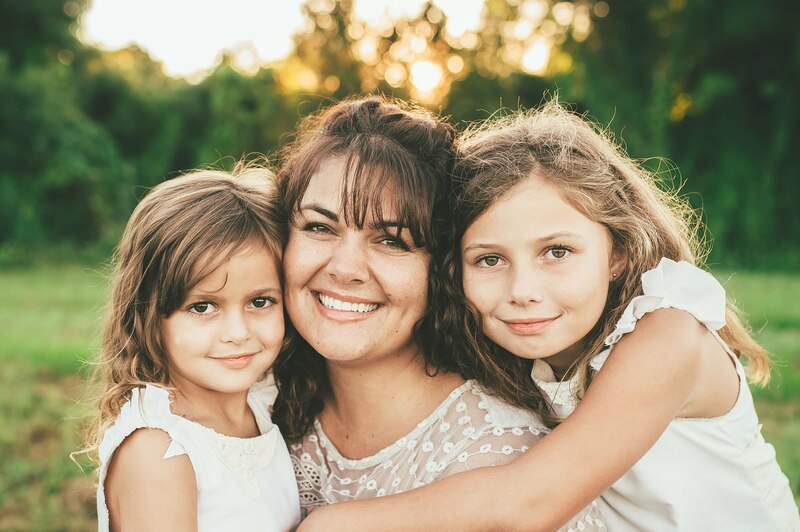 Laurie at Sonoma Scent Studio, Kyme at Bohemienne Life and now Pam at Lasting Scent Candles. I will miss them all terribly but wish them all much love and success. Do you use room or linen sprays? Oh no.. that means I won't be getting my hands on anymore Bliss any time soon. I think this was the vendor was it not? What an amazing scent that was! I do wish her the best though. Great haulage, soo many good ones. Toasted embers, Pink Sugared Spruce and Mint Mallow all sound Devine yet again I'm sure they are all wonderful. Enjoy! Maybe!! Pam did say that she will be going through her oils until they are gone. I will cross my fingers she has some Bliss oil left. Thanks! These mists will last me ages. All the scents sound amazing! I have read in a couple wax groups that she won’t be reopening but IDK for sure. That wax loaf.😍 I do love me some LSC; her bakery and lavender scents are especially magical. Between LSC, Can-Do and LPL the wax world has lost a lot of great vendors recently. I messaged Pam and she told me she will be opening back up for RTS and then again later to use up her remaining oils. This could change of course, but this is what she told me yesterday. We have lost many great vendors for sure. They will be missed. I grabbed 2 aroma mists and 2 scent shots, as that was my first LSC order. Pretty positive I've only heard about LSC from your blog, so I'm glad you have blogged and continue to do so even if scents are unavailable or a vendor is going out. I think your readers and people who happen upon your site really appreciate every detail.. I know I'm always coming back to research and look up stuff- you have a wealth of knowledge here, Julie. Thank you! It chopped up quick and easy. I hope you like what you got! Pam will have an RTS she said. So I am looking forward to that. Thank you for the kind words and thank you for the heads up on the Fortune Cookie spray! I made my first ever FC purchase for Savanna' LotR birthday (handsantizer) and they are really great. I am a big fan of FCS's hand sanitizers, very great product! As for room or linen sprays, we have a can of Glade or Febreze air freshener in the bathroom but that's it. As for that loaf though...wowza, that is gorgeous! So perfect looking for winter, and with a perfect sounding scent to match! We have been making use of the Lysol spray as of late with all the germs floating around. I am getting sick again. Ew. Well don't be getting sick before that epic LotR party!!! !